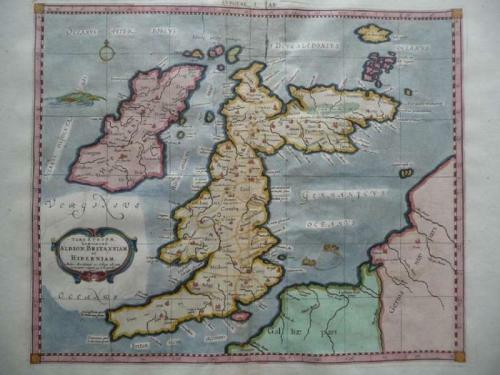 This rare map of the British Isles shows an early view of the cartographer's developing shape of the island. Albion takes a sharp right angle turn at Britannia (Southern Scotland), which is depicted as lying East to West. Hibernia lies in the Eastern Ocean (Atlantic). Britain is separated from France by the "British Ocean" and from Germany by the "German Ocean". Londinium is the capital. Originally published by Mercator in his 1578 edition, this map is state 3 of the plate and appeared only in the 1730 edition of the atlas. This edition of Ptolemy's maps feature beautiful cartouches and fabulous depictions of ficticious sea monsters. The map is in very good condition. Blank on verso and folded as issued. Centerfold is reinforced.